Jaguar Land Rover says it will cut 4,500 jobs as the carmaker addresses slowing demand in China and growing uncertainty about the U.K.'s departure from the European Union. The luxury carmaker says the cuts will be in addition to 1,500 people who left the business in 2018. The company employs about 44,000 people in the U.K. The firm, owned by India's Tata, last year outlined a 2.5 billion-pound ($3.2 billion) turnaround plan to deal with Brexit, trade tensions between China and the U.S. and new European emissions standards that combined pushed Jaguar into the red in the three months to Sept. 30, which compared with the same period the year before. CEO Ralf Speth says Jaguar is "taking decisive action to help deliver long-term growth." 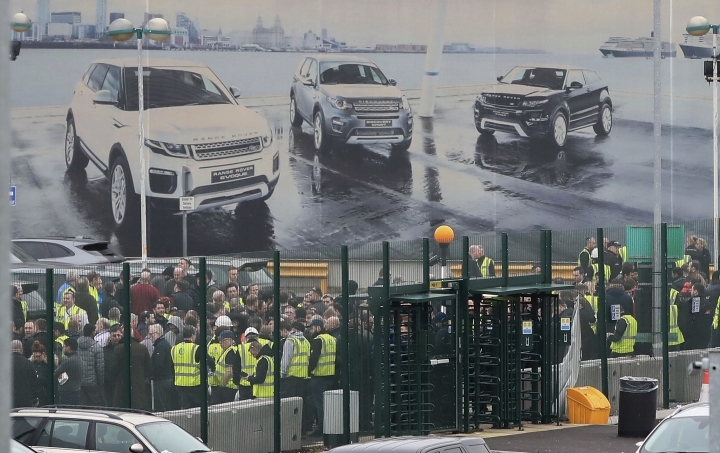 Britain's media is reporting that Jaguar Land Rover will announce up to 5,000 job cuts as the carmaker addresses slowing demand in China and growing uncertainty about the U.K.'s departure from the European Union. The BBC says the luxury carmaker will cut around 5,000 jobs in marketing, management and administrative roles. The company employs about 44,000 people in the U.K. The firm, owned by India's Tata, last year outlined a 2.5 billion ($3.2 billion) turnaround plan after Brexit, Chinese trade tensions with the U.S. and new European emissions standards left Jaguar with a pre-tax loss of 90 million pounds in the three months to Sept. 30, which compared with a 385 million pound profit in the same period in 2017. Thursday's announcement is set to include 2018 sales.